﻿ 2 Thessalonians 3:13 But as for you, brethren, do not grow weary of doing good. Brothers, do not get tired of doing what is right. But ye, brothers, do not become weary doing good. And as for you, brethren, do not become weary or lose heart in doing right [but continue in well-doing without weakening]. But you, brothers, should not get tired of doing what is right. And you, brethren, should not be weary in well-doing. And you, my brothers, do not get tired of well-doing. But you, brethren, be not weary doing well. But you, brothers, must not get tired of doing right. And ye, brethren, be not weary in well-doing. And ye, brethren, lose not courage doing good. But you, brethren, be not weary in well doing. But [as for] you, brothers, do not be discouraged [while] doing what is right. But you, brothers, do not be weary in well doing. 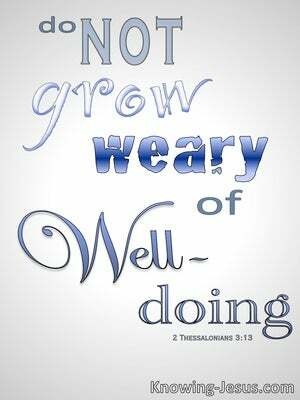 Brethren, be not weary in well doing. As for yourselves, brothers, never grow tired of doing what is right. But you, brothers, must not grow weary in well-doing. But you, brothers and sisters, do not grow weary in doing what is right. But you, brothers, do not be weary in doing well. But ye, brethren, be not weary in welldoing. But, brothers, be not weary of well doing. But ye, brethren, be not weary of well doing. You, Brothers, must not grow weary of doing what is right. But you, brothers, must never grow tired of doing right. But you, brothers, don't be weary in doing well. 12 Now such persons we command and exhort in the Lord Jesus Christ to work in quiet fashion and eat their own bread. 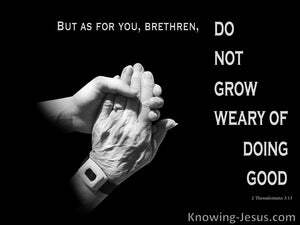 13 But as for you, brethren, do not grow weary of doing good. 14 If anyone does not obey our instruction in this letter, take special note of that person and do not associate with him, so that he will be put to shame. "You also say, 'My, how tiresome it is!' And you disdainfully sniff at it," says the LORD of hosts, "and you bring what was taken by robbery and what is lame or sick; so you bring the offering! Should I receive that from your hand?" says the LORD.